Last time on Not exactly what it shows on the tin, we looked at karate masters, space ships, motorcycles, ninjas and scarlet pimpernels (or does that pluralize to, 'scarlets pimpernel'?). But this time around, we're focusing exclusively on Cool Dudes on game cover art, and seeing how they stack up to their pixelated representation. And while we only have 3 games to see this time, one of them is a Gameboy cartridge...so that's slightly different! Cover Art: Backwards baseball cap, hooded sweater, torn jeans, walkman, snazzy sneakers -- the cover-art Maru is one happenin' '90s Dude! He's here to listen to bodaciously radical tunes and save his oddly 1950s-y main squeeze from a giant lizard being...and he's all out of "The Spin Doctors" cassettes! 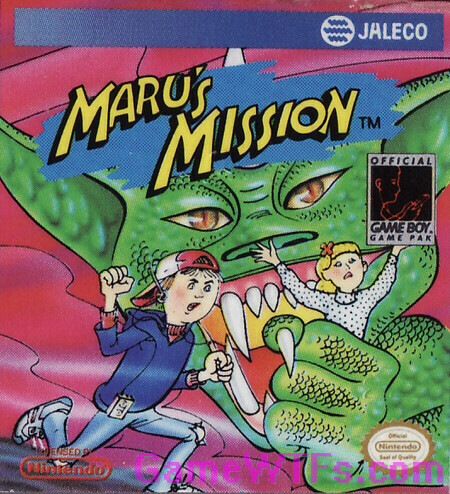 In Game: Well, Jaleco's North American regionalization team has done a lackluster job (again): they changed the cover-art from its original Ninja/Demon picture to this gnarly fellow/sock-hoppin'-sweetie/fish-monster thing...without altering your character in-game. *: not this. 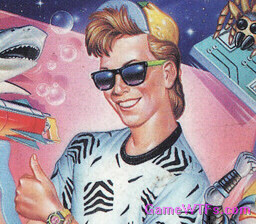 Well, hmmm...actually, more than then the Rad Dude we see on the cover. 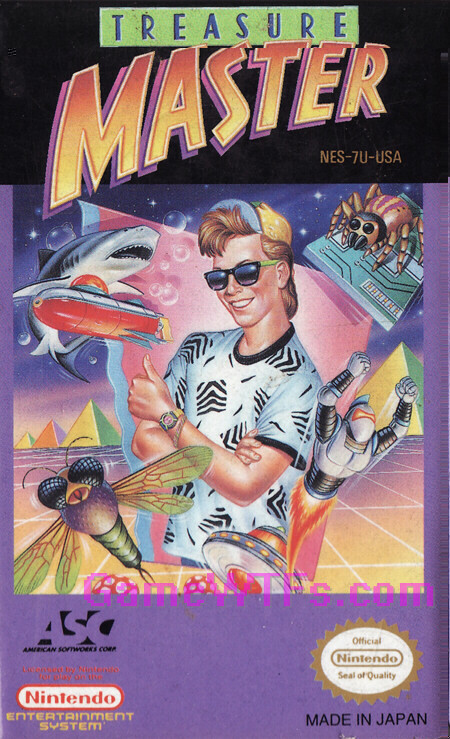 Cover Art: Is he the human version of Poochie, or of "Rude Dogg" from "and the dweebs" t-shirt fame? I mean, just look at the neon-green ear-piece on those shades; thumbs-up, indeed! In Game: He looks like Duke Davis's nerdy cousin: he's got an orange onesie rather than yellow onesie, a strut that has to be seen to be believed (one of these days I shall release an Animated GIF of it and rule the world), plus a kooky baseball cap, but...NO SUNGLASSES? Major un-cool! 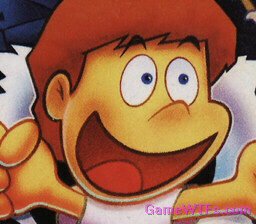 Cover Art: Cheerful yellow muppet. In Game: This may be the first North American-Release game where your in-game representation looks TOUGHER than his picture in the cover art. culminating in real-world attacks on his classmates! 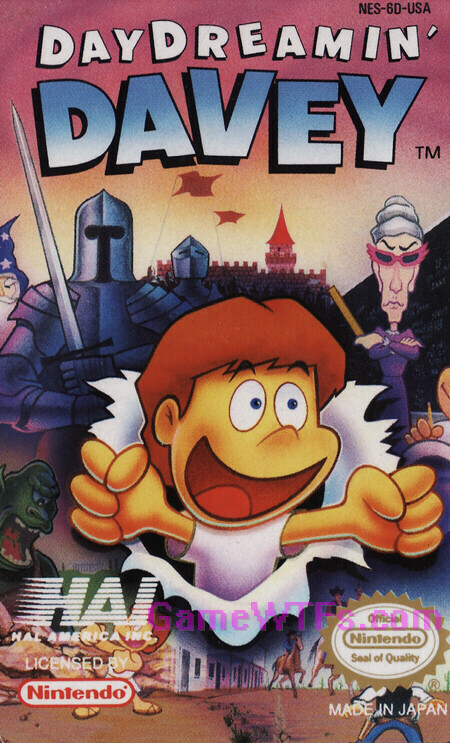 Davey may not be the crazed 4th-grader we want...but he may be the crazed 4th-grader we deserve. Well, tune in next week for more woefully out-of-date quotes about tremendously out-of-date games! Oh, and about that whole Treasure Master thing? Nintendo of America Inc. is expressly disclaiming them lots of luck with allll that.